Spiritual Friendship by Wesley Hill. Grand Rapids: Brazos Press, 2015. Summary: This is an exploration of the place of friendship in the life of the Christian, particularly its importance for those who chose, either because of sexual orientation, or other reasons to live celibate, chaste lives. The idea of a celibate, chaste, single life is scorned today not only because of the myth that one can only live a fulfilled, fully human life within the context of a sexually intimate relationship. Perhaps more fundamentally, if less openly acknowledged, this seems a terrible choice for those who are single, gay or straight, because it is a call to loneliness. 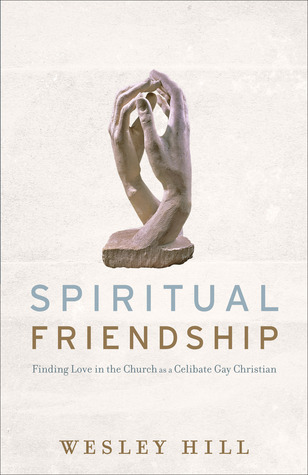 Wesley Hill, a celibate gay Christian contends that the greatest gift the church could give to those like himself, and indeed to all of its members, is a renewal of the idea of friendship–of voluntary, non-sexual relationships of deeply knowing and being known by another. Hill’s book is divided into two parts, the first laying out the historical and theological basis for the idea of friendship, and the second talking very honestly about the lived experience of friendship. The first part begins by talking about the eclipse of the idea of friendship in a sexualized culture.where any deeply affectionate and caring relationship between human beings is concluded to be sexual, something especially difficult for the gay celibate Christian for whom a deep non-sexual friendship may be a lifeline. Hill argues that it was not always this way, citing the examples of Dietrich Bonhoeffer and Eberhard Bethge and Aelred of Rievaulx Abbey and the idea of “vowed friendships”, friendships bound by vows similar to that of marriage but non-sexual in their expression of love.Christians have had a complicated relationship with the idea of friendship throughout history, believing that the gospel call to agape love that loves even one’s enemies relegates friendship to a lesser category. Yet Hill points to the relationship of David and Jonathan, Ruth and Naomi, and ultimately Jesus and his disciples who he call “friends” as counter examples and that what the gospel does is transform friendship from ‘we two’ to ‘we two who welcome a third and fourth’ in an outward looking community of love. The second part is more personal. He begins by discussing an issue I’ve wondered about; can friendship and romance be sealed off from each other, particularly when friendship is with a person whose gender one is attracted to. Hill contends that it is not, but that our sexual orientation, even if gay, is in fact a gift in relationships if offered up to God, a gift that brings unique sensitivities and blessing to another, if there are others willing to receive and enter in. The next chapter is the most vulnerable in the book where Hill speaks of what it is to love and lose in friendship. He describes a relationship with a male friend who subsequently enters into a romantic relationship with a woman and the deep sense of loss and hurt this meant for Wes. Friendships end. Sometimes friends die. To love deeply is to be willing to suffer, which is perhaps why we hang back from such love, knowing what it will cost. However he does not end here but rather in a chapter on the ways a church might begin to recover friendship and what it could mean not only to individuals but to the quality of community. Among his challenges is one to mobility. This probably touches me most, because I know of those I’ve bonded deeply with at various points in life, who moved away. There are times when moves are right, and we’ve moved ourselves on two occasions. Do we ever consider that refraining from moving for the sake of friendship and community may sometimes be right? I would have liked Hill to address the differences between healthy, deep relationships and unhealthy, co-dependent or manipulative relationships. I also wonder about how these deep friendships work out in the context of relationships with a person who is also married and is in that vowed relationship. It is apparent that he has enjoyed relationships with couples and it would be interesting to tease out these dynamics further. I will be thinking about this book for some time. I find deeply compelling, for Christ-followers, the idea that our sexuality is not ultimately something to be fixed or satisfied, gay or straight, but offered to God. Hill’s vulnerability challenges me with my own self-protectiveness that does not want to suffer, but in the end settles for the superficial. Might this not be the same challenge we face in the church?